SCOTTISH MOUNTAIN RESCUE badge with inscription "SHELL SEMINAR 2004 MICK TIGHE L.M.R.T. sewn round it. The history and events surrounding an item in our collection are often more interesting than the item itself and we think that's the case with this t-shirt. For nearly ten years in the 1990's and 2000's, founder of the Scottish Mountain Heritage Collection, Mick Tighe, was the National Training Officer for all Scotland's mountain rescue teams. Part of his (volunteer) duties was to organise an annual training event for the teams and in 2004 the venue was Balmoral. The royal household had been told by the government to make more use of their assets and because Balmoral was not used during the Winter the rescue teams got to rent it for a moderate fee. It was only for a weekend, but over one hundred rescuers from all over Scotland had an excellent time which included a stretcher race through the Queen's rose garden! John Fraser, a member of the Ochil's mountain Rescue team, made some commemorative t-shirts for the occasion - one of which we have here in the collection. 0730 - 0830 Breakfast at Balmoral Castle Restaurant. 0900 - 0915 Intro - Mick Tighe. 0915 - 0945 What Happens at Balmoral - Gwyn Jones, Ranger. 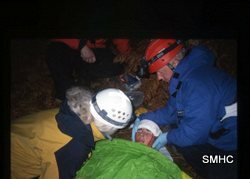 0945 - 1030 Stretchers & Cas Bags - Jamie Kean & Paul Rosher. 1100 - 1145 The Cairngorms - Adam Watson. 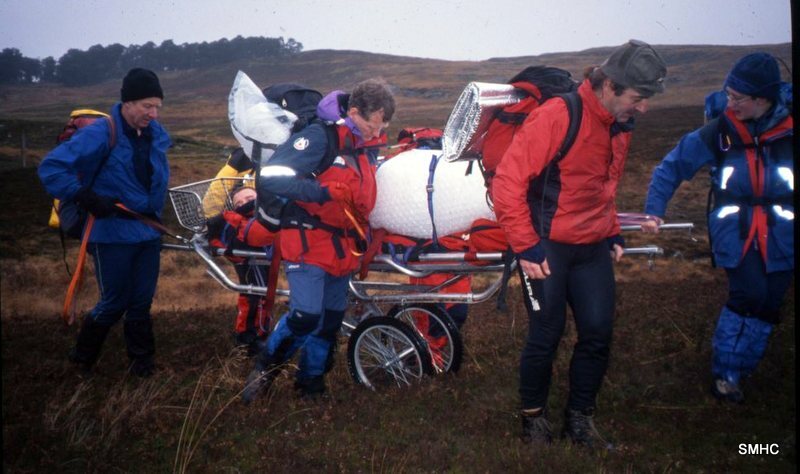 1145 - 1230 The New Mark VI Stretcher - Hamish Mclnnes. 1230 -1300 Briefing for afternoon activities. 0900 - 0945 The Lochaber Perspective - Jonothan Hart. 0945 - 1000 The Bigger Picture - Mick Tighe. 1030-1115 Helicopters - Nick Barr. 1115-1200 Sea King. 1200 - 1300 The Big Quiz.